Margie Bodas is admitted to practice in Minnesota state and federal courts. Margie Bodas is an experienced Minnesota bankruptcy litigator and law firm practice manager. She litigates bankruptcy disputes such as preference claims, turnover actions, issues relating to the property of the bankruptcy estate, fraudulent transfers and other adversary actions. Most often she helps creditors who find themselves at odds with a bankruptcy trustee related to issues such as a claim for return of payments made to the debtor as a preference or the avoidance of a mortgage due to filing problems. She also helps businesses and individuals file proofs of claim. In addition, she litigates workers’ compensation disputes in both the administrative system and the state and federal district courts – defending against workers’ compensation claims, pursuing subrogation claims, defending employers’ liability and .82 actions, resolving insurance coverage and premium disputes. She is rated AV Preeminent® for the highest level of professional excellence by Martindale-Hubbell. As Vice-President of Practice Management at Lommen Abdo, her duties include business development, marketing, staffing, finances and oversight of the day-to-day operations of our firm. She was selected as one of the Minneapolis St. Paul Business Journal’s Women in Business in 2012. 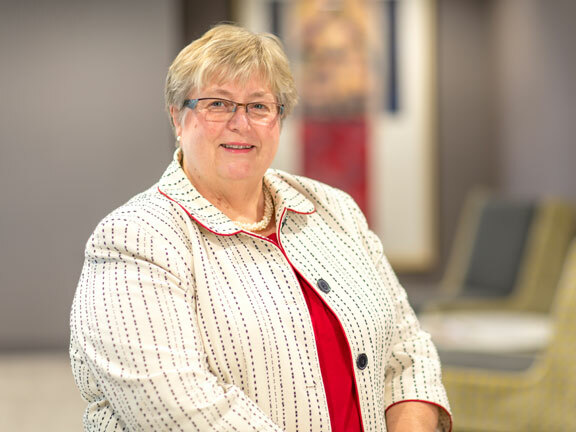 Margie is actively involved in the Minneapolis Chamber of Commerce’s Executive Women’s Council and is a member of the Minneapolis St. Paul Community Board of Trustees for the Jeremiah Program. She is also a strong supporter of Friends of Ngong Road, Hope Community and the Hope Chest for Breast Cancer. Prior to her legal career, she coordinated an award winning community drug prevention program on the Iron Range and won awards as the news editor of the Mesabi Daily News. Today she is an avid Gopher football and basketball fan, baker of bundt cakes and an itinerant traveler. Are You Prepared for the Changes in UCC Article 9?